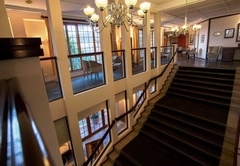 The Wilderness Hotel is a highly recommended Wilderness hotel providing accommodation in 150 guest rooms for tourists visiting the Garden Route region. 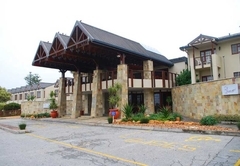 The Wilderness Hotel has a grand tradition and reputation as a honeymoon spot, a family hotel and a tourist and business destination. 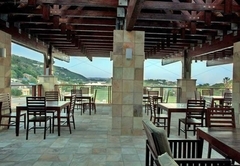 The hotel is steeped in tradition and has a warm, old-style charm yet is a modern hotel with all the facilities you need. 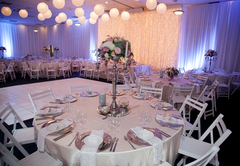 The 150-bedroom establishment boasts a beauty spa, two swimming pools, a bowling green, two tennis courts, a squash court. Large suite with two rooms: one furnished with a King size bed and the other with two singles. There is a sauna bath, shower, private courtyard, lounge and kitchen. 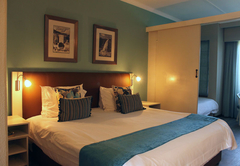 Refurbished rooms furnished with a King size bed and en-suite bathroom. 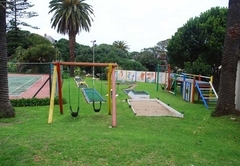 Facilities include a tea / coffee station, flatscreen TV with DStv and air-con. There are views of the gardens, mountains and lagoon. Spacious rooms with a King size bed and en-suite bathroom (with both bath and shower). Room facilities include a tea / coffee station, TV with DStv and air-con. The rooms have views of the gardens. Spacious rooms with a double bed and en-suite bathroom (both bath and shower). Room facilities include a tea / coffee station, TV with DStv and air-con. The rooms have views of the gardens. Spacious rooms with two single beds and an en-suite bathroom with bath and shower. Room facilities include a tea / coffee station, TV with DStv and air-con. The rooms have views of the gardens. Spacious room furnished with a King size bed and two single beds. The room has an en-suite bathroom with both bath and shower. Room facilities include a tea / coffee station, TV with DStv and air-con. The room has a view of either the lagoon or bowling green. This is a spacious family room furnished with four single beds. The room has an en-suite bathroom with both bath and shower and boasts view of the lagoon or bowling green. Room facilities include a tea / coffee station, TV with DStv and air-con. The rooms have views of the gardens. A family room with two double beds and en-suite bathroom with bath and shower. Room facilities include a tea / coffee station, TV with DStv and air-con. The rooms have views of the gardens. These rooms are ideal for the budget traveller. Furnished with a King size bed the room also has an en-suite bathroom with bath and shower. 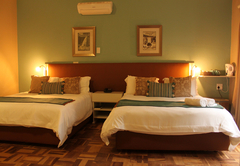 Room facilities include a tea / coffee station, TV with DStv and air-con. The rooms have views of the gardens. These rooms are furnished with two single beds and have views of the garden and hotel grounds. There is an en-suite bathroom with either a bath or shower. 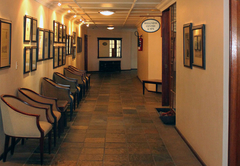 Room facilities include a tea / coffee station, TV with DStv and air-con. 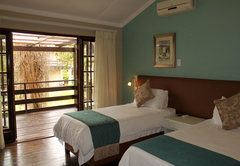 The room is furnished with two double beds and has an en-suite bathroom. Room facilities include a tea / coffee station, TV with DStv and air-con. The rooms have views of the gardens and grounds. These family rooms have a King size bed and two bunk beds in an adjoining room. Both rooms share an en-suite bathroom. Room facilities include a tea / coffee station, TV with DStv and air-con. The rooms have views of the gardens. 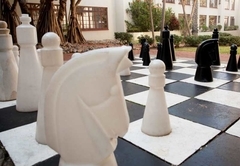 The Wilderness Hotel is about 45 minutes’ drive from both Mossel Bay and Knysna and a little less than an hour to Oudtshoorn in the Klein Karoo – and ideal location for tour groups and individuals who want a base from which to explore the region. 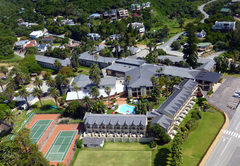 The village of Wilderness is nestled between the Kaaimans River and the Wilderness National Park. Wilderness has gained a reputation as an internationally sought after holiday destination. From as early as the 1800's, the village of Wilderness was renowned for its hospitality and the incredible natural beauty of the region. Large suite with 2 rooms, King sized bed in one room and 2 Single beds in the other, a sauna bath, seperate shower, private enclosed courtyard, lounge and kitchen. Interleading rooms, each with its own bathroom. Rooms consists of 1 x Double bed, and 2 x Single beds. Patio doors lead to Courtyard Gardens. 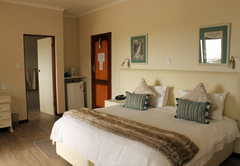 Newly refurbished rooms consisting of a King sized bed and en-suite bathroom facilites (walk-in shower). Amenities include coffee/tea making facilites, flat sctreen TV with selective DSTV channels and air-condtioning. Views of Garden / Mountain/ Lagoon. Spacious room with King bed an en-suite bathroom facilites (walk-in shower). Equipped with coffee/tea making facilites, TV with selective DSTV channels and air-conditioning. These rooms have views of the hotel's gardens. 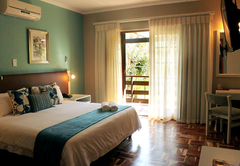 Spacious rooms with 2 Single Beds and en-suite bathroom facilites (walk-in shower). Equipped with coffee/tea making facilites, TV with selective DSTV channels and air-conditioning. These rooms have views of the hotel's gardens. Spacious family room with 1 King sized bed, 2 single beds with either a lagoon / bowling green facing view. This room has an en-suite bathroom (bath/shower in one). 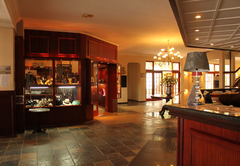 Equiped with tea / coffee making facilities, selective DSTV channels and air-conditioning. 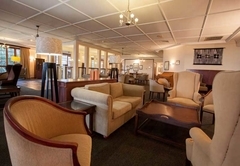 Spacious family room with 4 single beds with either a lagoon / bowling green facing view. This room has an en-suite bathroom(bath/shower in one). 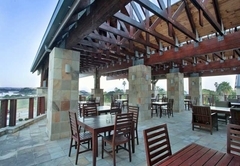 Equipped with tea / coffee making facilities, selective DSTV channels and air-conditioning. 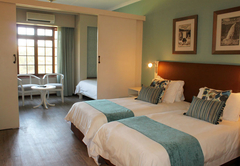 Family rooms consisting of 2 Double beds, and en-suite bathroom facilites (walk-in shower). Equipped with coffee/tea making facilites, TV with selective DSTV channels and air-conditioning. These rooms ahve views of the hotel's gardens. Perfect for the budget traveller, these rooms consists of a King size bed with an en-suite bathroom (bath/shower in one). Equiped with tea/coffee making facilities, selective DSTV channels and air-conditioning. There rooms have views of the hotel gardens. Perfect for a budget traveller these rooms consists of 2 single beds with views of the Garden / Hotel grounds. Rooms have en-suite bathroom (bath/shower only). Equiped with tea / coffee making facilities, selective DSTV channels and air-conditioning. Family room with 2 double beds with an en-suite bathroom. 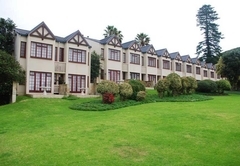 Equipped with tea / coffee making facilities, selective DSTV channels and air-conditioning. These rooms have lovely views of the hotel's gardens and grounds. Family room with 1 King sized bed and 2 bunker beds in an adjoining room. Both rooms share an en-suite bathroom. 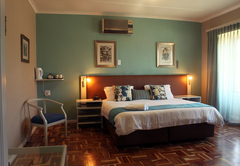 All rooms are equipped with tea / coffee making facilities, selective DSTV channels and air-conditioning. Room has a view of the gardens. We come as a family every year and every year we love it! This year was no different. Thanks again to all the staff for making my families stay so memorable. see you all next year again. 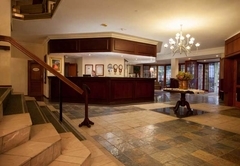 Response timeThe Wilderness Hotel typically responds to requests in 5-10 minutes.